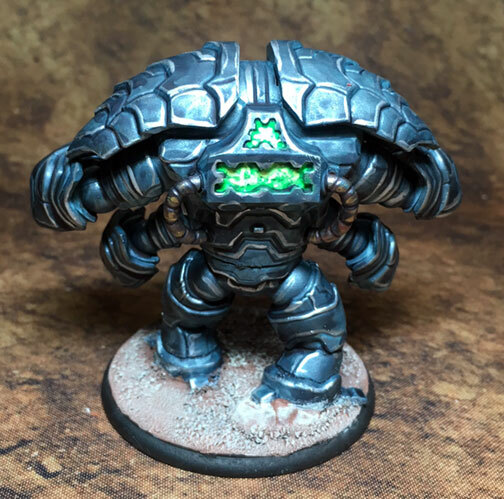 This Alien Robot is one of the XL Enemy packs you can pick up to add to your game. Its a pretty straightforward solid model that wasn’t difficult to assemble. 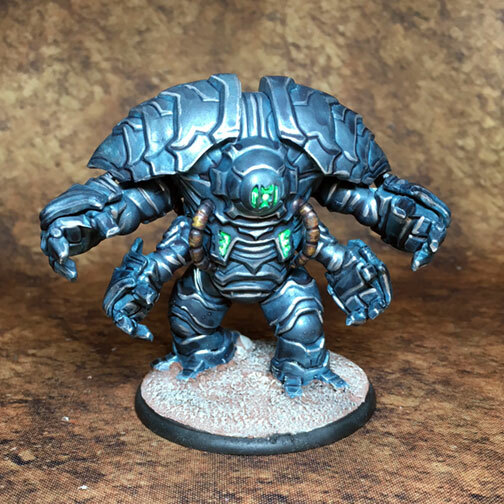 Before reading the information about the model I assumed it was some type of rock golem or mechanical suit – I was close – this is a large monster you can fight while traversing the Targa Plateau. To get the alien metal look I started with a light grey base washed with GW’s new ghost blue technical paint. I followed that with a heavy dry brush of gunmetal followed by a line-wash in the crevices with blue wash. A quick silver edge highlight finished this one up. I have several more packs from Brimstone to paint up this month for this same client. You can see some of the other models I’ve done for this collection here.